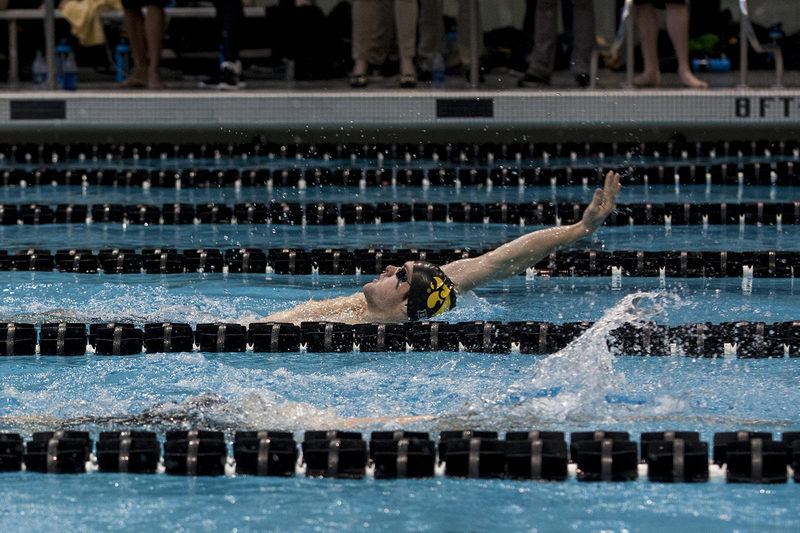 Hawkeye swimming and diving continues championship season as the Iowa men host the Big Ten Championships. Iowa swimmer Kenneth Mende swims at the Campus Recreation and Wellness Center on Saturday, Dec 5, 2015. 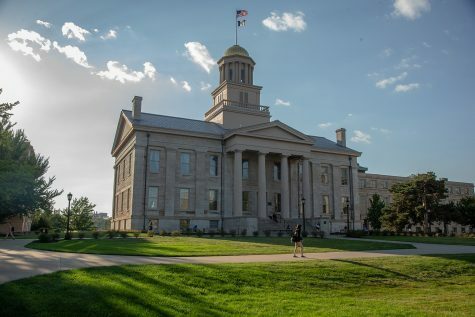 The Iowa men’s swimming and diving team will start the championship season when it hosts the Big Ten Championships today through Saturday at the Campus Recreation & Wellness Center. 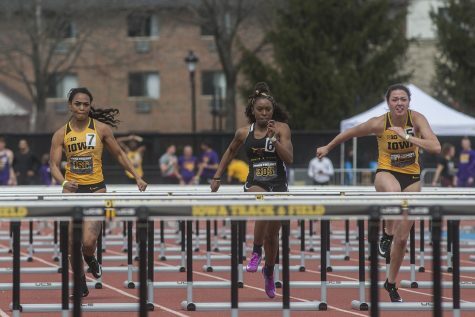 The last time the Hawkeyes hosted a conference championship meet was in 2015, and they are ecstatic to do it again. 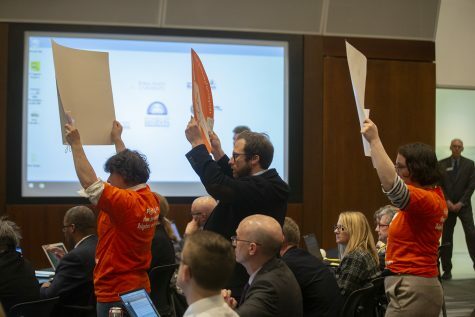 The opening session will start at 6:30 p.m. today. 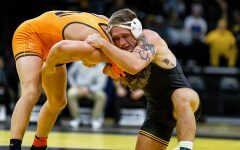 Thursday through Saturday will have preliminaries at 11 a.m., and finals will begin at 6:30 p.m.
Iowa finished the dual season 6-2, but it is only 3-2 in Big Ten action. The Hawkeyes beat Michigan State (193-98), Wisconsin (164-136), and Northwestern (194-106) but fell short against Michigan (232-121) and Minnesota (158.50-14.50). 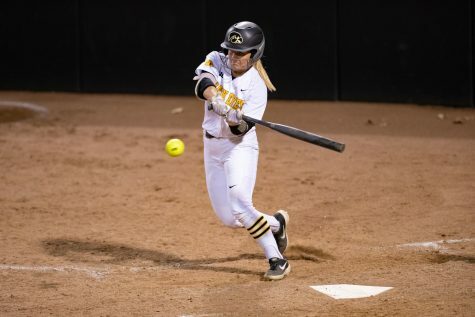 The Hawkeyes have a lot of talent this year, which makes it hard for any particular event to stand out. Iowa has home-pool advantage, and hopefully for the Black and Gold, it will be to use that. 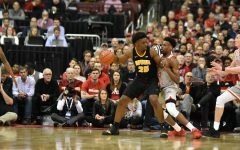 The Hawkeyes are sitting good — they have had good performances from both the underclassmen and upperclassmen. Senior Will Brenner, junior Joe Myhre, sophomore Anton Hoherz, and Mende will be four athletes to watch. All four enter the Big Tens sitting near the top in their events. 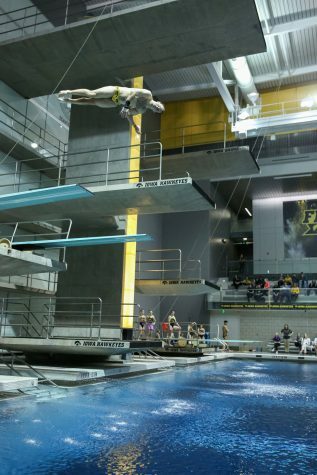 Iowa diver Anton Hoherz dives from the 3m board during a swim meet against the University of Northern Iowa and Western Illinois University on Friday, Feb. 1, 2019. Brenner is No. 8 on the 3-meter springboard (394.30), Myhre is No. 8 in the 50 free (19.86), Hoherz is No. 9 on the platform (365.35), and Mende is No. 10 in the 200 back (1:44.25). Mende’s 1:44.25 was good enough for him to meet NCAA “B” qualifying standard. Myhre met qualifying time in the 100 free (43.76). Two others met “B” qualifying — sophomore Daniel Swanepoel on the 200 breast (1:57.56) and freshman Mateusz Arndt in the 500 free (4:23.31). 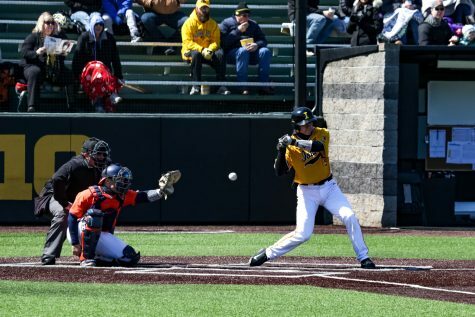 Another feature for the Hawkeyes is that so far, 25 of out 27 athletes on the Iowa men’s squad have broken their personal records this season. Some other swimmers to watch for are the sprinters. Seniors Jack Smith and Matt Kamin and juniors Myhre and Will Scott hold spots in the top 10 in both the 100 and 50 free. 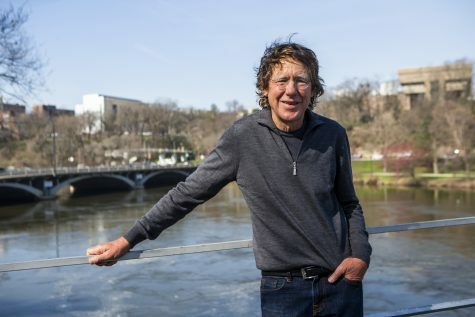 Senior Michal Brzus is No. 10 in the 100 free (43.88), barely beating out freshman Aleksey Tarasenko’s time of 43.89. Smith, Kamin, Myhre, and Scott will all return the 200-free and 400-free relays, in which they hold the records. 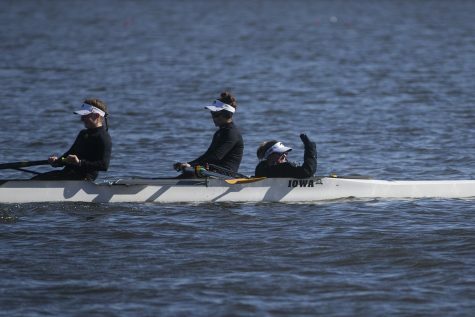 Apart from individual events, Iowa is also deadly in the relays. Iowa is ranked among the top 10 in the Big Ten in five of them: the 200-free relay is No. 4 (1:18.90), the 800-free relay is No. 5 (6.30.40), the 400-free relay places No. 6 (2:57.41), the 400-medley relay is No. 7 (3:14.60), and the 200-medley relay is No. 8 (1:27.89). Some of the Hawkeyes believe that relays have a possibility of being dominant. Day 1 starts at 6:30 p.m. with the 200-medley relay and the 800-free relay.